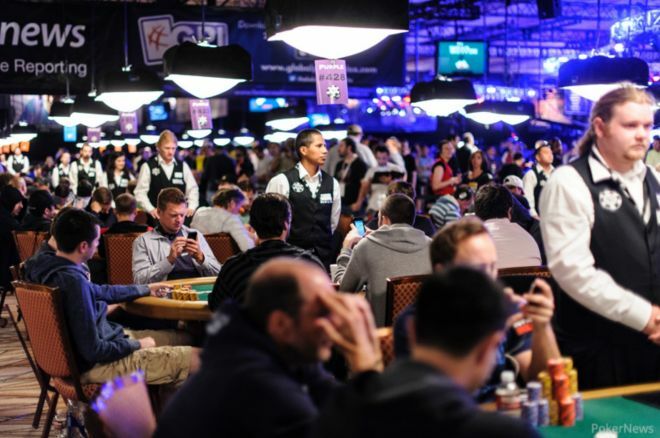 There will be no more fields of thousands at the 2014 World Series of Poker this summer, as they are now down to just one event in one room — although it’s a big room, and the biggest of events, too. Day 4 of this year’s $10,000 buy-in Main Event resumes today in the Amazon room at the Rio All-Suite Hotel and Casino, with Andrew Liporace and Mehrdad Yousefzadeh returning as the only players currently with more than a million chips. There are 746 hopefuls left from the 6,683 who started the tournament. They’ve all outlasted thousands, but none has earned a single cent as yet for doing so as the bursting of the money bubble has yet to occur. Just 693 will be cashing in this year’s Main Event to earn a share of the tournament’s massive $62,820,200 prize pool, meaning 53 players will be departing empty-handed today. Those who do outlast those players will all be guaranteed at least $18,406, the prize due to those finishing 622nd-693rd. Meanwhile all continue to eye the huge payouts up top, including the $10 million first prize awaiting the winner. Pictured to the right is the scene during hand-for-hand play a year ago when Farzad Bonyadi became the unfortunate player to bust one shy of the cash during Level 16. Bonyadi was given an entry to this year’s Main Event as a consolation prize, and he's made the most of it so far as he enters Day 4 with 396,000. Start-of-day chip leader Liporace has just one previous WSOP cash, with the New Orleans-based player having earned a small one in a $1,000 no-limit hold’em event in 2010. The New Yorker Yousefzadeh also has only earned a couple of modest in-the-money finishes at the WSOP, though does have a big WSOP Circuit title under his belt having won the WSOP-C Caesars Atlantic City Main Event in 2007 and a $488,828 prize. Sitting in third position is Raul Mestre of Valencia, Spain. Mestre only has one WSOP cash on his tourney résumé as well, having made the money in the 2009 Main Event when he finished 427th, though has amassed nearly $1 million in total live earnings playing in Europe in addition to significant online success. Others returning to significant stacks include David Tuthill (in 11th position with 850,000), Dan Smith (15th, 817,000), Griffin Benger (19th, 792,500), John Kabbaj (21st, 780,000), Ali Eslami (22nd, 770,000), Raj Vohra (25th, 745,000), Kenny Tran (28th, 728,500), Martin Jacobson (721,500), Ola Amundsgard (38th, 644,000), and Morgan Popham (49th, 603,500). Eddy Sabat (597,000), Goran Mandic (593,500), Andrey Zaichenko (590,000), Isaac Baron (585,000), and Brian Townsend (543,500) will all also be coming back to big chips today, as will 10-time WSOP bracelet winner Phil Ivey who finished last night with 522,500. With the current average stack 268,753, Kyle Keranen (502,500), Mukul Pahuja (487,000), Jared Bleznick (479,000), Mike Sowers (473,500), Leif Force (414,000), Jeff Madsen (350,000), Abe Mosseri (333,500), and Maria Mayrinck (293,000) will additionally be among those returning to stacks that are above par today. Sitting just below average to start will be 1996 Main Event champion and four-time bracelet winner Huck Seed with 249,000, the lone player remaining who has won this tournament before. in Seed’s neighborhood chip-wise will be Michael Binger (234,500), Maxx Coleman (233,000), Daniel Alaei (216,000) Kory Kilpatrick (210,000), and Hasan Habib (207,500). NASCAR driver Jason White has also steered his way to Day 4 where a stack of 134,500 will be awaiting him at the day’s starting line. Action was halted last night with 53 minutes left in Level 15 where the blinds are 2,000/4,000 with a 500 ante. Players sitting with 20 big blinds or less, then, to start Day 4 make up the bottom 100 in the counts (approximately), and thus will be the ones sweating the bursting of the bubble the most once play begins. Some notables in that group include Thiago Nishijima (80,000), Eddie Ochana (75,500), Ben Palmer (72,500), Yueqi Zhu (61,000), JJ Liu (50,000), Vitaly Lunkin (37,200), and Vadzim Markushevski (16,900). 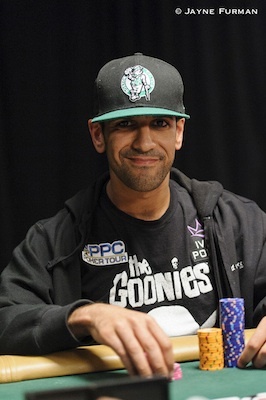 There are few players left among the 746 with hopes of rewriting WSOP Main Event history with their finishes, including Ronnie Bardah who is one of those coming back to below average chips with his 108,500. Bardah’s first WSOP Main Event cash in 2010 was a memorable one as he made it all of the way to a 24th-place finish for a $317,161 score. In 2011 he returned to the Main Event to finish 453rd ($27,103), in 2012 took 540th ($21,707), and last year he cashed again, lasting long enough to make it to 124th ($50,752). With that fourth straight Main Event cash a year ago, Bardah joined a handful of others who have performed the same feat, including Christian Harder who also earned his fourth straight in 2013. (Harder busted on Day 2b this year). Other members of that exclusive club include Robert Turner (1991-1994), Bo Sehlstedt (2004-2007), Theodore Park (2005-2008), Chris Overgard (2007-2010), and Chris Bjorin (2008-2011). If Bardah can make it through the bubble today, then, he’ll have the record all to himself with five straight Main Event cashes. Click here to watch to him discuss that possibility with Remko Rinkema late last night. Meanwhile if Allen Cunningham (314,000) makes the money today that will mark the seventh time he’s cashed in the WSOP Main Event, putting him into a tie for fifth on the all-time list. 1986 Main Event champion Berry Johnston (eliminated on Day 2c this year) holds the record with 10 ME cashes. Last year’s Main Event winner Ryan Riess was knocked out on Day 3 to end his title defense. Thus only one of the 2013 November Nine remains in the field to start today’s Day 4, with last year’s ninth-place finisher Mark Newhouse coming back today to a healthy stack of 423,500. There’s a long way to go, but Newhouse would be the first player since Dan Harrington (2003-2004) to make a second straight Main Event final table should he make it through four more days of poker. Play picks back up today at 12 noon PDT with that bursting of the bubble — one of the more exciting moments of the summer at the WSOP — due to happen not long afterwards. Don’t be late, then, when checking the Main Event live updates for start-to-finish coverage of all the Day 4 action.